It takes its title from Saville’s large-scale drawing on canvas of the same name which features in the exhibition. Jenny Saville is best known for her large-scale oil paintings of female nudes and use of paint to depict flesh. After graduating from the Glasgow School of Art in 1992, she received widespread acclaim and has gone on to have a hugely successful international career. Exhibitions of her work have taken place worldwide, including solo exhibitions at the Museo d’Arte Contemporanea Roma (Rome, Italy), Norton Museum of Art (West Palm Beach, USA) and Modern Art Oxford (Oxford, UK). Saville’s monumental self-portrait, Propped, previously exhibited at the Scottish Gallery of Modern Art Summer 2018, sold for £9.5 million. Breaking the auction record for a living female artist. Artwork description. This work represents recent developments in Saville’s practice in which she layers imagery to suggest movement captured simultaneously. In such works Saville draws upon a range of sources, including art history, ancient myths, graffiti and children’s drawings. The title refers to a text by the Ancient Greek philosopher Plato entitled ‘Symposium’, a work of literary flair that offers philosophical commentary on the nature of Love. The overlaying of line and form in Saville’s work reflects formal qualities found in Plato’s manuscript, particularly the way he weaves together different ideas, presented by multiple speakers throughout the text. Edition Edition of 100, plus 25 Artist proofs. 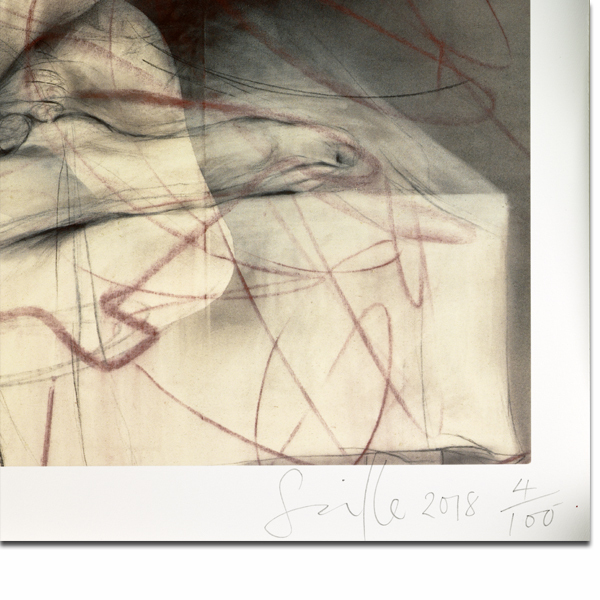 Pack of 10 postcards to accompany the exhibition NOW Jenny Saville. Tote bag featuring a detail from One out of two (symposium) by Jenny Saville. This stylish t-shirt is also a collector's item.